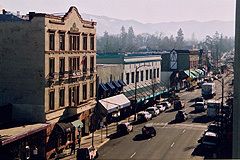 We think you'll have to agree that Ashland, Oregon has to qualify as one of the world's distinctive communities. It has a diverse character comparable to cities much larger, somewhat unique for a city of only 20,000. The first time visitor will notice the friendly easy going attitude and relaxed lifestyle the populace of Ashland seems to exude. It can't help but leave a favorable lasting impression on those who visit this tucked away loose knit community. Check out our FAQ's on Ashland. Check out the Ashland Chamber of Commerce website. Check out the City of Ashland's Website.